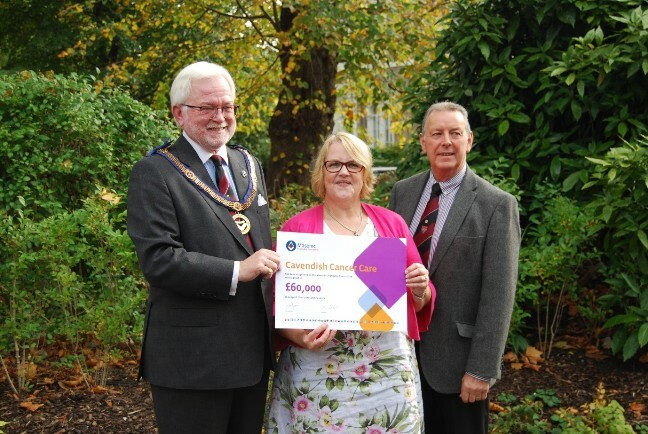 More than 800 cancer patients will receive therapy or counselling following a grant of £60,000 to Cavendish Cancer Care from the Freemasons. Assessors are the first point of contact at the centre and form a fundamental part of the support process. The Assessor will talk through a person’s concerns and will help them to decide on treatments. At the end of a client’s course of therapy, they will undertake a review and will re-refer clients if they feel they would benefit from more Cavendish support, or refer them onto other services. As well as supporting patients, Cavendish also offers support to their carers and loved ones, including their children who can use the centre’s specialised young people’s service. Carly Honeycombe was diagnosed with Hodgkin’s Lymphoma at the age of 26, and visited Cavendish alongside her chemotherapy for sessions of reflexology and healing. The grant from the Freemasons Province of Yorkshire West Riding, comes through the Masonic Charitable Foundation, which is funded by Freemasons, their families and friends, from across England and Wales. “Cavendish Cancer Care has had a long association with Yorkshire, West Riding Freemasons”, said director of fundraising, Jason Briggs. John Boyington from the Province of Yorkshire West Riding said: “We’re very pleased to be able to help Cavendish Cancer Care. To have an Assessor available can make all the difference to people who have had their lives turned upside down by a cancer diagnosis.